A lens hood is a must for every D-SLR photo enthusiast. 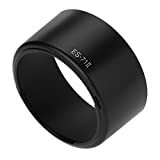 A lens hood is primarily designed to avoid unwanted stray light from entering the lens by extending and shading the end of the lens. It is not original goods, only Compatible! This entry was posted in Discount Photography and tagged 50mm, Canon, compatible, ES71, f/1.4, Hood, lens, qobobo® by Ball Photo. Bookmark the permalink.